Sharpening Axes conducted sales focused workshop entitled “Sell the Solution – Selling Techniques to Create Customer Value” in partnership with NextStep last June 23, 2016. Jerel Bonner, Founder of Sharpening Axes, is a sought-after executive coach, author, writer and motivational speaker. He has spent over 35 years in the business. He has also dealt with international companies, developing training programs to help employees maximize their learning styles resulting in the desired outcomes in their organizations. The goal of the workshop was to help sales people, including sales managers, sales directors, and business development managers understand key selling tactics and techniques to help improve their sales process and learn how to maximize their dealings with decision makers. Here are six takeaways from the workshop. Nowadays people don’t buy products. Gone are the days when selling meant motivating customer commitment with the main objective of closing the deal. 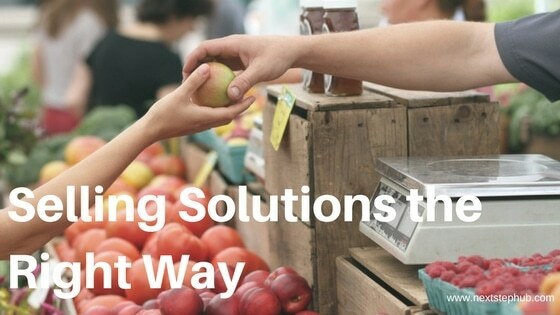 If you want to grow your business, focus on helping your customers resolve their concerns. Assist customers to overcome business challenges by listening to their pain points. Assess their concerns and come up with a solution that will answer their needs, assist them in the execution of the solution, then follow up. By helping them grow their business, you also build yours. Make sure to do your research to get to know who to talk to. Check out LinkedIn pages, company websites and other resources to understand the company structure. Find out the go-to person besides the owner of the company, who might already be swamped with phone calls and meetings here and there. Take advantage of gatekeepers and ask who the right person to talk to the next time you call. Some contacts may include KOLs, Purchasers, and even project managers who are in charge of execution. Customer Relationship Management (CRM) Solutions are designed to help businesses manage customer data and customer interaction. They also help access business information, automate sales, marketing, and customer support. They manage employee, vendor, and partner relationships.It also can tell you which clients you need to follow up with and direct you to events and other marketing activities that can generate more leads for you. It can integrate with email and calendar software and can be accessed through mobile devices. Some CRMs are available at no charge. How much data can you store online? How do they define data? Which apps can it be integrated with? Does it come with browser support? Active listening and asking the right questions are two of the best tools you should have when you’re in sales. SPIN, which stands for Situation, Problems, Implications and Needs, is questioning technique that can help decision makers analyze their current situation, and determine the pain points they are experiencing. It also helps you present possible outcomes if needs aren’t met, confirm the customer’s needs and propose a custom fit solution for their business. You can also help direct the client’s decision making through insight selling, where you can either present a particular solution to the client or come up with strategies through open-ended questions to narrow down what needs to be done. It also helps to give the client a vivid description of his requirements, as well as the results if these needs are not fulfilled. An effective proposal reflects the quality of your firm, your offer, your services, and your skills as a “business enabler”.Inside your proposal should be a list of its contents, which includes the business’ current situation, its challenges, implications and needs and the solutions that your company can offer. It should also have information about your company as well as contact information and your availability for future appointments. Make sure to write concisely and create outlines for easier browsing.